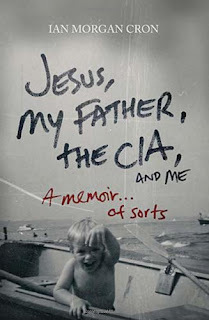 Jesus, My Father, the CIA and Me is a memoir...of sorts. Author, Ian Morgan Cron, tells his life in a personable and off-hand manner, knowing he has lived this life, but not totally believing all the players in his game. As a young boy, he had many questions concerning his father and their lifestyle. His father was very mysterious and would often be gone for long periods of time or have to stop what he was doing and head off into the unknown. When Ian found pictures of his dad playing golf with the president, he questions his mother, who is just as enigmatic as his father. All through his life, Ian is left with more questions than answers and he must struggle with his own inner demons to become the man he was meant to be. The reader is taken on a journey that seems almost fantastical in places and heart-wrenching in others. We learn of Ian's fathers addiction to alcohol and how it eventually removes him from the game. We learn of Ian's struggle with his father's love, always left wondering if his father did, in fact, love him and he wasn't just a "tool" of the trade. We learn of Ian's struggles with Jesus and God and their intentions for his life. How he embraces their lessons and applies them to his life. We watch as he walks the path less traveled to come to a point in his life where everything seems to fall into place and his message is clear. This was a very engaging book by Ian Morgan Cron, who also authored, Chasing Francis: A Pilgrim's Tale, which was also an exceptional read. You can read my review here. I thought the insights into his life were written in an enjoyable and thought-provoking method. I enjoyed reading his thoughts and worries and his projections for the future. I thought his grip on reality was an interesting one and I enjoyed his sharing it with me. The writing is engaging, interesting and easily read. The reader will find minor to mild expletives, which might surprise the average person, especially when you read that the author is an Episcopalian minister. It is that honest, "average-joe", writing style that will submerge the reader into the author's realm of life and leave you with a well-blended tale of one man's life and the choices he makes. I would give this a four out of five stars, while I thought the book was a great read and I am sure anyone who reads it would agree with such, I just found there was a certain something lacking from its pages that would have made it exceptional, maybe a degree of warmth that was lacking or maybe it was the introduction of his faith, the people that surrounded him, cajoling him into their fold, it kind of gave me a creepy feeling and I am unsure how I would handled the situation. If it wasn't for the good-looking girl coming into the picture, who knows where Ian Morgan Cron's life may have ended, it was certainly looking like he was heading down a path of destruction. When he was sixteen years old, Ian Morgan Cron was told about his fathers clandestine work with the CIA. This astonishing revelation, coupled with his fathers dark struggles with chronic alcoholism and depression, upended the world of a boy struggling to become a man. Decades later, as he faces his own personal demons, Ian realizes the only way to find peace is to voyage back through a painful childhood marked by extremes-privilege and poverty, violence and tenderness, truth and deceit-that hes spent years trying to escape. In this surprisingly funny and forgiving memoir, Ian reminds us that no matter how different the pieces may be, in the end we are all cut from the same cloth,stitched by faith into an exquisite quilt of grace.